St Andrews is the spiritual home of golf, attracting thousands of players to experience its hallowed turf every year. St Andrews & Fife is rated 4.7 out of 5 based on 42 verified reviews from YGT customers. They played and stayed (we even checked they signed their scorecards). The town of St Andrews, in addition to its array of world renowned courses, oozes golf from every pore, and the golfing spirit flows throughout its charming streets. While the ‘auld grey toon’ may steal most of the limelight, the surrounding Kingdom of Fife plays an able support role; the sandy soil of the East Neuk seems heaven sent for golf, and is home to traditional links like Crail and Lundin, as well as Kyle Phillips’ mind-blowing creation at Kingsbarns. 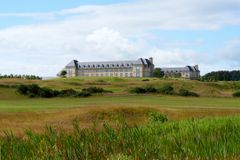 Fife offers some of the best golf on Scotland’s east coast, and makes for superb golfing tours, while recent years have seen the development of outstanding resorts – both Fairmont St Andrews and the Old Course Hotel offer outstanding bases from which to venture forth into the remarkable golfing landscape. With so many incredible courses to enjoy, a golfing experience in St Andrews and Fife is absolutely essential for any serious golfing enthusiast.